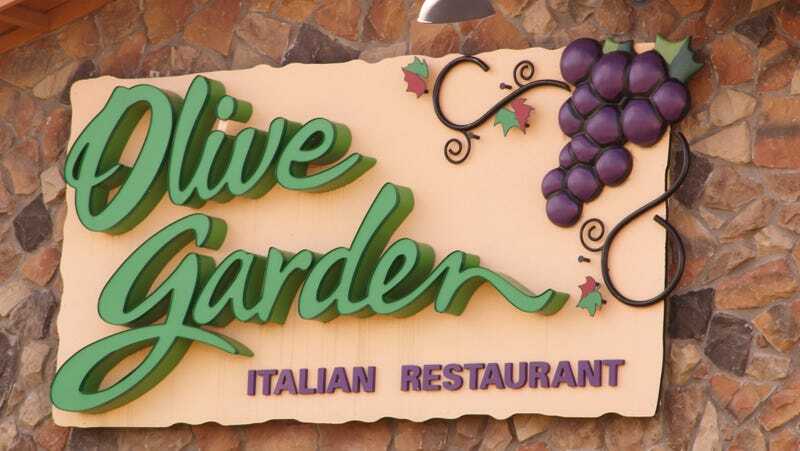 You gotta hand it to Olive Garden. It takes the possibly limited palette of pasta, sauces, and breadsticks and keeps combining into different concoctions that can only be described as inspired (Taco Bell does the same; most chains, for that matter). For example, fresh off the success of its Italian Nachos, a 1,410-calorie concoction of “pasta chips,” cheeses, and hearty meat sauce, comes a new creation called Lasagna Dip. Keep it to yourselves, haters, because this sounds delicious: Cheese, hearty meat sauce, which you can dip with pasta chips. Wait a minute. How is this different from Italian Nachos, except the chips are separate from the meaty cheese sauce? So it’s Italian Nachos, remixed. Good for Olive Garden for tricking us into writing about this. MSN notes that these luscious layers of meat and cheese will only be available until January. When you’re here, you’re eating everything but the tablecloth.